This project is complete. No additional impacts are expected. Leveled out the crest on OR 213 to improve visibility by raising the slant of the highway. Added a standard right-turn lane and shoulder on South Union Mills to separate left and right turn movements. Added a two-stage turn for westbound Union Mills to turn onto OR 213, which allows cars to move into the turning lane on OR 213 before entering southbound traffic. Paved a section of OR 213 and South Union Mills Road. Constructed mountable curbs along properties at the intersection to divert storm water. Unsafe driver speeds and limited visibility (because of the hill crest) on OR 213 make it hard for drivers to see oncoming or turning cars. This has resulted in serious injury, left-turn crashes at this intersection. 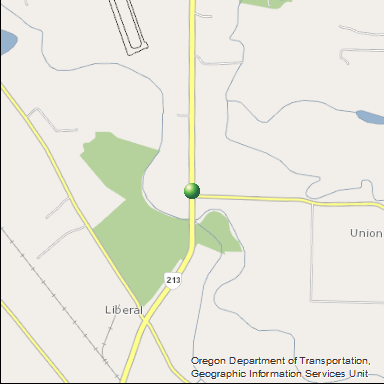 El Departamento de Transporte de Oregon (ODOT) y el Condado de Clackamas están diseñando un proyecto para mejorar la seguridad en OR 213 y South Union Mills Road. Se espera que la construcción tenga lugar de enero a noviembre de 2018. Problema: Las velocidades inseguras del conductor y la visibilidad limitada en el OR 213 (que hace que sea difícil para los conductores ver los coches que se aproximan) ha resultado en graves accidentes de giro a la izquierda en esta intersección. Si desea obtener información sobre este proyecto traducida al español, sírvase llamar al 503-731-4128. Если вы хотите, чтобы информация об этом проекте была переведена на русский язык, пожалуйста, звоните по телефону 503-731-4128. 이 프로젝트에 관한 한국어로 된 자료 신청방법 전화: 503-731-4128​. Nếu quý vị muốn thông tin về dự án này được dịch sang tiếng Việt, xin gọi 503-731-4128. 2018-Open-House-Displays-18789.pdf View displays from the Feb. 13, 2018 open house. Fact-Sheet-18789.pdf View the project fact sheet. This was also distributed at the Feb. 13, 2018 open house.